I begin this post with a question. Do you want to be a successful in life? I strongly believe that your answer will definitely, “Yes, of course! I want to be successful in my life.” That is so true. There is no one in this world who doesn’t want to reach a success in their lives. We all want to success in career, business, marriage, family, study, ministry or whatever it is. Maybe this time you all have achieved a certain level of success in a particular field. That’s great! Be grateful! However, not the least people among us still struggling to achieve a success. There are many people who actually have a life contrary to that I mentioned above. There are still many people who always fail to get a success. Many people said that failure is a part of process. OK, I agree! But it wasn’t supposed to ongoing forever. 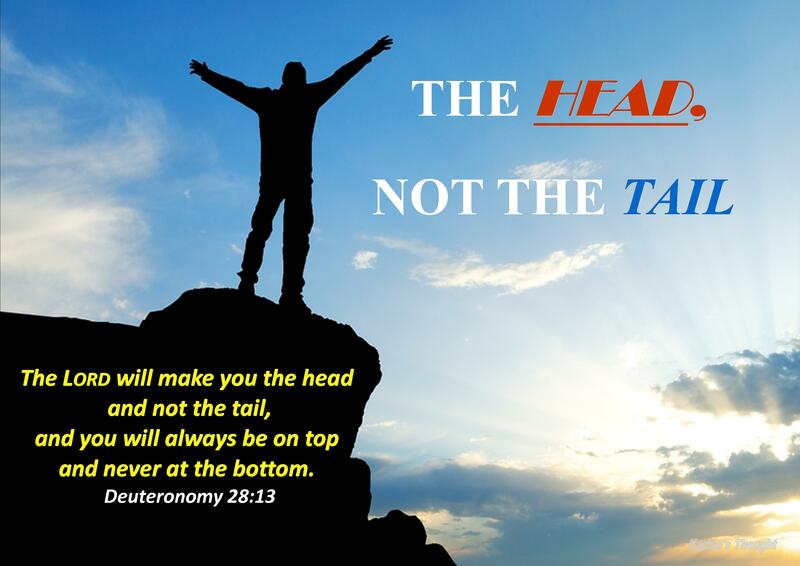 God wants to put each of us to be the head (successful) and not the tail (unsuccessful). Keep going up, not down. If we continue to be a tail and at the bottom, it could be a sign that there is something within us and it should be fixed. Talk about the head and tail position, I love took the Joseph’s story as an instance. We all know since childhood Joseph was different than his other brothers. Jacob loved him more than his other children. (Gen.37: 3) and it made his brothers jealous and hated him. This is the beginning of Joseph’s suffering series. The suffering began when he told about his dream. (Gen.37: 5-7) Heard his dream; Joseph’s brothers hated him more and have a plan to kill him. (Gen.37:18) Fortunately, He wasn’t killed. But survived from murder plan didn’t make his life totally safe. His life still threatened because he was thrown into the dark cistern. Then even though he was free from the dark cistern, it was not a truly freedom because in fact his brothers sold him to the Midianite (Verse 28) Now Joseph’s status is as a slave. His status is not as the head, but the tail. Then what happen next? It turns out Joseph bought by Potiphar one of Egypt’s captain of the guard. Joseph didn’t have a mental that always grouchy. He underwent his “profession” as a slave very well, whatever he did, he always succeed. Even though in the tail position, he could be the head. Why? Because The Lord with him. Joseph’s life journey becomes lighter? Not really. The next problem came. He tempted by Potiphar’s wife. (Genesis.39:7 NLT) But Joseph flatly refused. He wasn’t tempted by momentary pleasure because he wants to live in obedience. The flesh may be willing, but his spirit refused. Joseph said: how could I do such a wicked thing? It would be a great sin against God.” (Genesis 39:9 NLT) Because continuously rejected, Potiphar’s wife was furious and malign Joseph so he was thrown in jail. Position increasingly dropped! Joseph’s status now no longer as a slave but as a prisoner. How Joseph’s attitude? His attitude remains the same. He didn’t complain or blaspheme anyone, including God, but he still showed remarkable attitude that always obey and please the Lord. Again we will see the similar condition like in the verse 2 but in the different place, in the prison. Difficulties might be increase but the fact, Joseph remains did as best as he could. Again we see that in the bottom position which lowers than a slave, Joseph can still be a head. Why? The answer once again, because The Lord with him and caused everything he did to succeed. We all know the end of this story. For he successfully interprets Pharaoh’s dreams, he gets amazing position. From the prisoner became the most powerful man in the all land of Egypt. (Genesis 41: 40-42 NLT ) Joseph eventually became the true head. God always be with us not only when we are in the safe and comfort season without any problems but God still be with us even in the outer darkness. Why God was always be with Joseph in any circumstances? Let’s go back to the Deuteronomy 28:13 to get the answer. You must not turn away from any of the commands I am giving you today, nor follow after other gods and worship them. From the verses above we can get 5 points. First, listen to God’s command. The Second, obey to His word. Third, not turn away of His command. Fourth, not follow other gods. And the last is, only worship God, not god. Joseph was successfully went through these 5 points and made it as his guideline. Joseph was obedient did these things no matter the condition he faced. He wasn’t disappointed, not trying to find other alternatives to survive. He didn’t grumble and blaspheme, he didn’t despair, and he hadn’t lost hope. Joseph choose to remain believe and walk with God in obedience and finally God made him the head, not the tail. My dear readers, maybe this time we are experiencing very unpleasant phases in life. We may facing failures and in the tail position. Or we may currently in a hard struggle to pursue a success. This time allow me to encourage all of us one thing: Don’t be afraid and discouraged because God always be with us in any circumstances. No matter what condition we are today, let’s keep hold fast to the God’s word, believe without doubt at all, don’t tolerate the sin’s trap and don’t be tempted to take other alternatives because we impatient to undergo the process. God has promised that He will make us the head. And not only that, He also promised always be with us same as He was always be with Joseph. Even we walk through the darkest journey; if we always walk very close with Him, at the end of journey we will get success. I am thinking about our life, especially in our Christian life. Belief oftentimes becomes a serious problem. 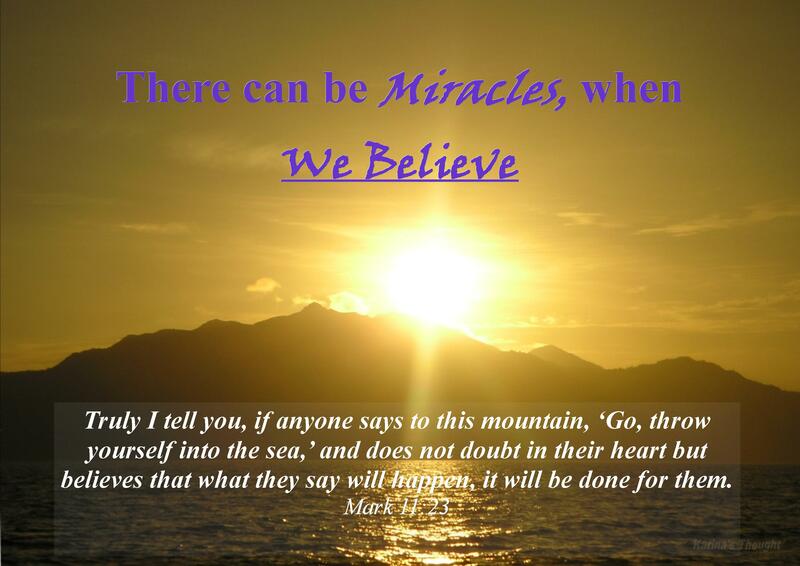 We are really hard to believe when we are talking about God’s miracles. Without we realize God’s miracle often fails to happen not just because God doesn’t care or doesn’t hear our cries, but in fact caused by our doubt or disbelief. There are so many wonderful and amazing God’s promises that are able to provide the salvation assurance and the life full of victorious in this world. But sadly, when the promises not become a reality, we begin to doubtful, we begin to asking is it true God will fulfill His promises? Eventually, because of our doubts, we will blame and accuse God that He has broken His promises. This is that become the base point of the problem. Our hearts and mind shrouded by the mist of doubt. We are standing on the grey zone between believe and doubt. Whereas, the Bible has been many times affirmed that we have to brushed off doubts from our hearts, Jesus repeatedly reminded and even admonishes us to believe. But unfortunately, we often unsuccessful rid of the doubts and even worse we let the doubt continue to dominate our hearts and minds. And this problem doesn’t only happen at this time but has happened thousand years ago. For the example let’s have a look to the story of the death of Lazarus in John 11:1-44. Martha and Mary hoped Jesus would come when Lazarus was sick. They knew that Jesus could heal their brother. But their beliefs in God just stop there. Just to heal. Martha and Mary said: “if you had been here, my brother would not have died.” (Verse 21, 32) Then Jesus said: “Your brother will rise again.” (Verse 23) Initially they only believe that Jesus can only heal the sick, and Jesus will raise the dead at the last day. Martha answered, “I know he will rise again in the resurrection at the last day.” (Verse 24) Where is the disbelief of Martha and Mary? They extremely believe Lazarus will rise again at the last day, but rise physically after death four days?! Their logic cannot believe it! Therefore, they were reprimanded by Jesus because due the low of human belief to the God’s Power. Then Jesus said to Martha: “I am the resurrection and the life. The one who believes in me will live, even though they die; and whoever lives by believing in me will never die. Do you believe this?” (Verse 25-26) And finally Martha said that she believed (Verse 27). The story is end? No! It turns out Martha still has doubts. When Jesus came to the tomb and ordered her to open the stone, Martha said: “But, Lord, by this time there is a bad odor, for he has been there four days.” (Verse 39) Martha’s logic said this was an impossible thing because Lazarus was dead four days and had bad odor. Lazarus is impossible to alive again. But behold what Jesus said: “Did I not tell you that if you believe, you will see the glory of God?” (Verse 40) And there was an incredible miracle. Lazarus rose again from the dead. My beloved friends, sometimes our burden befall so heavy and it makes us cannot keep focus on faith that accompanied with full of beliefs when we ask for help through our prayer. Martha’s attitude was representing our attitude where our beliefs limited on our own logic only. Our logic couldn’t make us believe that God can do miracles and can do anything beyond our logic. Or we are in a condition want to believe but hard to believe. I am reminded a story when Jesus healed a possessed boy in Mark 9:14-24. The boy’s father said: “I do believe; help me overcome my unbelief!” (Mark 9:24 NIV) The Father’s word also representing what often occurs in our lives today. “I want to believe, but please help to believe” in colloquially, this is that might always we say. So the problem is about belief in God and that’s why God’s miracle often fails to happen in our lives and we seem difficult to see God’s glory. Why we could be so hard to believe that there is no prayers that not answered by God and there is no one thing that cannot be done by Him? Well, I will answer these questions with an example based on my daily lives. Since few months ago I had a new personal secretary. I’ve known her previously but not too close. Has become my custom, I got to know very well the person who became my personal secretary. I got to know her character, personality, mindset, abilities, and even what she likes and dislikes. Why do I need to do this? In order that I could completely believe to her that she could assist me to doing my work and I could believe that she can do anything I ask. That’s why I always preserve and maintain my personal relationship stay close with her. What I did to my secretary also applies to God. How can we entirely believe to God if we don’t really know Him? How we can say love God if we don’t really know Him and don’t even have very close relationship with Him? How far do we know God will be greatly determine how big our belief in Him. To be able completely believe in God, we must first know Him very well! How do we know God? The potent way is through the scripture that contains God’s word. Scripture is a God’s tool to introduce Him to us and the way He communicates with us. Through the scripture we will know His personality, character, everything He did for mankind, His teachings, and what He wants from us. Next, to know God’s personality can also be done through our personal experience walking together with Him. When David faced Goliath, he could be bravely and confident because he learn from his experience as a shepherd. If God had previously accompanies and protects him in facing a wild animal, he also believed that God would remain along with him against Goliath. (1 Samuel 17:34-37 NIV) So it is with us. If right now we are given the opportunity to live, work, could serve God, and do many things; it all is only grace from God. If we still able to face and overcome so many big problems and challenges, it is a proof of God’s providence and inclusion in our live.